Mobile Cuisine Magazine | The nation's first magazine covering everything in the mobile food industry. The nation's first magazine covering everything in the mobile food industry. Psst, Come Here! I have a secret to tell you. Well, no, it’s not a secret, as a matter of fact let everyone know. Mobile Cuisine Magazine is moving. We are moving urls to http://mobile-cuisine.com (be sure to bookmark it). Please check us out and let us know what you think. We’ve added content, as well as changed formats. The grand re-launch will take place on December the 6th so this url will remain active until then. After the re-launch, this url will redirect you to the new site without any of this content remaining, live. Not to worry though, if you enjoyed this content, it has already taken a trip to the new site and can be found there, in it’s entirety. Thank you for your loyal support of these sites. Here it is, Thanksgiving, and we’ve been reflecting on some of the things for which we have to be thankful. Our list includes some of the usual – family, country, and employment during challenging times, but we have come up with an additional list of 10 things we are thankful for within the food truck industry, and wanted to share it with you. The way communities are re-writing their laws to allow more trucks to open. The various and creative cuisine food trucks are providing their customers. The ability for people to follow trucks through social media. The way the food truck industry has helped numerous communities economically. The spread of positive coverage of the industry within the mainstream media. The time, effort and donations that people in the industry have given to help organizations that help feed the needy. The friends we have made from publishing this magazine. The knowledge we have gained from researching the food truck industry. The wonderful food we have been able to eat while visiting various food trucks. The food truck community itself and the wonderful people in it. You are our readers, the people we write for and about. No other business community has such a loyal group of members and we hope for continued success in our coverage, and the industry as a whole. 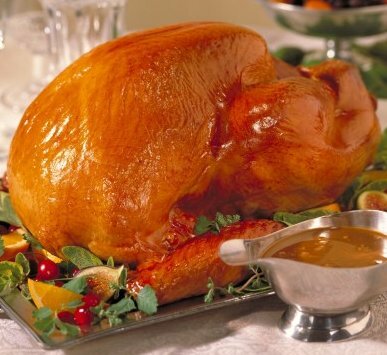 So when we cut into our holiday birds and reflect on all the things for which we’re thankful, one of the biggest will be the fact that we have this industry. From Mobile Cuisine Magazine, Happy Thanksgiving everyone! If you are thankful for something about the food truck industry, please share it in the comments below. In today’s earlier article we covered a story of a food truck owner being hit and killed by another driver. This and the fact that the winter months are coming to us quickly got us thinking to provide a list of tips that truck owners and drivers should maintain constant knowledge of to prevent themselves from being the next or causing the next fatality on the road. 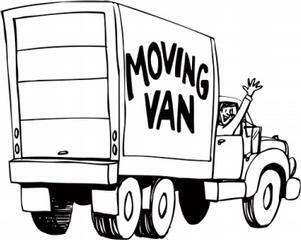 The most important part of a moving truck is the driver! Get plenty of rest before getting behind the wheel. Eat well and stay fit. Remember, driving without proper rest can threaten your livelihood or even your life. Stay healthy and well rested, or don’t drive! Inspect your vehicle before each trip and check your brakes regularly. Learn how to inspect your brakes, identify safety defects, and get them repaired before risking your life and others on the road. Other drivers may not be aware of the size of your truck’s blind spots. Be vigilant in watching out for vehicles in the No-Zone. The No-Zone represents the danger areas, or blind spots, around trucks where crashes are more likely to occur. One-third of all crashes between trucks and cars take place in the No-Zone. Watch out for road construction. Stay alert. Work zone crashes are more likely to happen during the day. Almost one-third of fatal crashes in work zones involved trucks. Take your time going through work zones and give yourself plenty of room. Expect the unexpected! Always leave enough space between you and the vehicle in front of you. If you hit someone from behind, you are typically considered “at fault,” regardless of the situation. Trucks require more stopping distances than other vehicles. Take advantage of your driving height, and anticipate braking situations. Buckle up for safety and control. If you are in a crash, a seat belt can save your life and those around you. It will keep you in your seat and allow you to maintain control of your truck. A major cause of truck fatalities involves being ejected from the vehicle. Wearing seat belts is still the single most effective thing all drivers can do to save lives and reduce injures on our roadways. Avoid aggressive drivers! It’s estimated that each year two-thirds of all traffic fatalities are caused by aggressive driving behaviors. 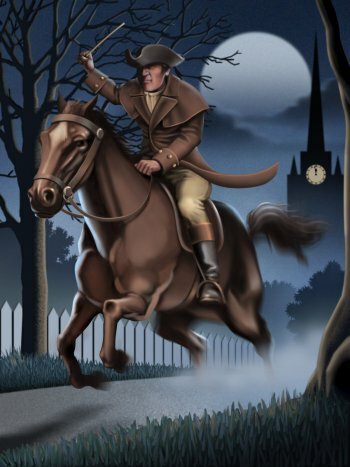 Keep your distance and maintain a safe speed. The only thing speed will increase is your chance for a crash. Be the professional on the highway and at safety events! Help stranded motorists; notify traffic safety agencies of crashes, unsafe drivers, unsafe roadway conditions, and other situations that can lead to crashes. Your participation in public safety events and your performance on the highway can change public perception! We understand that these tips would not have prevented Jose Goncalves’ death; however we felt that providing these tips can still help those who spend time behind the wheel of a food truck. Please be safe on the roads. Jose Goncalves, owner of “Joe’s Cafe”, was standing outside of his food truck near Park and 7th St., in Newark, NJ, when a speeding car slammed into them last Thursday morning. He was taken to University Hospital where doctors pronounced him dead shortly before 9 a.m., said Katherine Carter, spokeswoman for the Essex County Prosecutor’s Office. At the time of the accident Goncalves was speaking with his wife, Vania, who was also hit by the car, but not injured. No charges have yet been filed for the driver, from East Orange, who was being treated for shock at the scene. 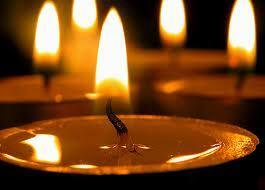 Mobile Cuisine Magazine sends out our thoughts and best wishes to Mr. Gonclaves’ friends and family. Mobile Cuisine Magazine is proud to provide our readers with another article designed to inform them about a multifaceted program that is spreading throughout the country. 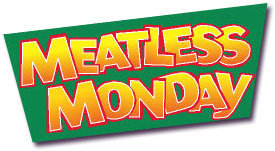 We have designated our Monday features to help promote the Meatless Monday’s program which not only do we support on the website, but our staff actually has adopted in our Monday dietary lifestyle. In today’s article we will focus on some of the fallacies that most vegetarians or vegans have to deal with every day of their lives. When someone decides to make this dietary leap they are normally questioned by friends and family as to how healthy giving up meat actually is. The critics (usually only informed by propaganda the meat industry has hand fed them over the years), usually come up with the same questions and they are typically centered on protein intake. We want to dispel a number of myths related to protein, since this argument seems to be always brought up when trying to dissuade people from eliminating meat from their diet, even if the program only promotes giving up meat on a single day of the week. During the 6 months I spent as a full time vegetarian the word on the street about vegetarians was that we didn’t get enough protein. If I didn’t eat meat how in the world was I getting the amount I needed? According to those who questioned me, meat is the ONLY viable source of protein. This may be the most commonly held misconception about a vegetarian diet. People fail to realize that meat is not the only source of protein in nature and today, we are going to prove it. Proteins are polypeptides (i.e. amino acid chains) which are essential for cellular health. Your body already produces most amino acids, but there are 9 amino acids that are essential and must be sought out. Protein, along with fats and carbohydrates, are considered macronutrients, meaning your body needs large quantities of them to function. Proteins are classified as either “complete” or “incomplete” based on whether all 9 essential amino acids are present. You can only get protein from animal sources. The only way this statement we’re true is if we modified the word protein with the word “complete”. And that’s where we believe this myth comes from, people associating complete protein as the only true protein. You need to eat a lot of protein daily. People have been misled to think that they need to load up on protein to be healthy, the more protein the better. Well, this is false. Americans actually consume MORE than the necessary amount of daily protein. While there is no agreed amount for required daily protein intake, some scientific bodies have put it around 10%-20% of daily calorie intake (given that you take the recommended calorie intake). And some have suggested that you eat half a gram of protein for every kilogram of body weight. Legumes – also called dried beans are edible seeds that grow in pods. Examples are chickpeas, split peas, haricot, lentils (red, green or brown), kidney beans etc. Nuts & seeds – Nuts are fruits that have a hard outer shell that encloses a kernel, which is also called a nut. Seeds are contained in fruits of plants and are capable of reproducing a new plant. Many nuts and seeds are available both in and out of the shell, whole, halved, sliced, chopped, raw, or roasted example are cashew, peanuts, walnuts, almonds. Dairy products – Dairy foods are products made from milk, the liquid secreted by female mammals for suckling their young. Choose nonfat or low-fat milk, yogurt and cheese for daily consumption. Save high-fat cheeses and ice cream for occasional treats. 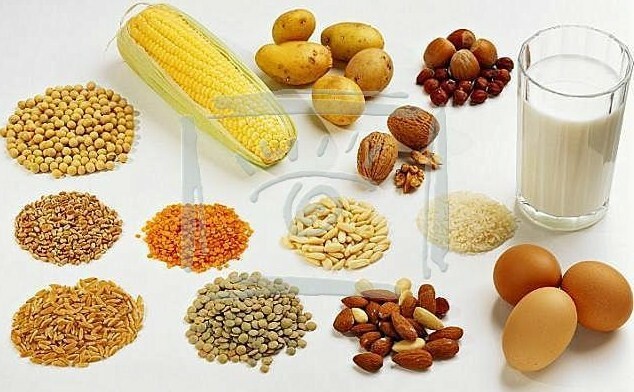 Cereals & food grains – Grains are the seeds or fruit of cereal plants, used as food by humans and animals. Choose whole grain flours, cereals, wheat & rye breads, buckwheat pancakes, muffins & scones, noodles and pasta. Check the nutritional facts panel on the label for fat, sugar, and additives. Eat grain with complementary protein. Experiment with high quality grains, such as amaranth and quinoa. Soyabean – A versatile bean use extensively in cooking, the soybean also serves as the basis for a wide variety of soya foods consumed. Soybeans are the richest plant source of high-quality protein. The most common soya form is still tofu, but today, the soybean takes on many other forms, including burgers, dogs, bacon, sausage, and many other meat substitutes. Seitan – has been used in Asia as a protein source and meat substitute for hundreds of years. Seitan can be prepared from scratch using whole-wheat flour. The flour is mixed with enough water to make into a dough that is then kneaded in water and rinsed to remove the starch and the bran. The protein, or gluten, remains and is then simmered in a broth flavored with soya sauce to become seitan. The longer the gluten simmers, the firmer it becomes. Seitan can then be sliced for sautés or stir-fries, diced into stews, soups, or casseroles, or formed into roasts. People who are allergic to wheat or wheat gluten should avoid seitan. Do not use if you are gluten-sensitive. A good source of protein delivering 23g/30 gms of Seitan. Vegetables – are loaded with vitamins and minerals essential for varied body processes and have been shown to provide protection against a variety of illnesses. Textured vegetable protein is also a good substitute for ground beef in dishes such as tacos, chilli, and stews. Eggs – Brown or white? Either and both is a source of complete protein. The color of the egg’s shell is simply an indicator of the breed of hen that laid the egg. Eggs yolks are among the few foods that contain vitamin D. Eggs are the centerpiece of a range of foods. Many egg dishes, such as omelets and frittatas, can be prepared quickly with many interesting fillings, such as peppers, tomatoes, or zucchini. We hope that those of you that have avoided joining this movement because of the protein fallacies you’ve been taught over the years, can take the information from this article, to help yourself take a healthy step the next time you are planning to find a food truck on Monday, In an earlier article, we suggested some and provided a list of vegetarian and vegan food trucks if you would like to follow them. We hope this list helps you in finding a truck in your area. Please do your part today and join the Meatless Monday movement? Signing up is fast and easy! Follow them on Twittter. Mobile Cuisine Magazine looks forward to continued coverage of Meatless Monday for our readers! Staying in the state of Ohio as we did earlier this week with a profile of a Columbus food truck, in today’s spotlight, we move southward to Cincinnati where the City Council just approved the cities fourth location for food trucks to congregate to provide their mobile offerings. Back in June, the City Council approved a pilot program giving food trucks three designated places to park. Twenty vendors have permits from the city to use the locations. Councilwoman Laure Quinlivan, who introduced the legislation, spoke with constituents, vendors and business owners in the areas around the locations and found all but a few pleased with the program so far. Trucks have been able to park on Court Street, at Fifth and Race streets, adjacent to Sawyer Point parking, with the new location added; they may also park south of the Purple People abutment. This new location is scheduled to have its first vendors show up on Monday. In a means to appease some business owners near the Court Street location, the Council also voted to limit the hours of this truck spot to 6 am to 3 pm. It should be apparent that this type of arrangement is more attuned to cities that do not have the same type of foot traffic that many urban centers in the United States have. Rather than just shrugging their shoulders and turning their back to bringing the people of their city more food options, we applaud Cincinnati for their continued support of their community and the food truck industry there. Cafe de Wheels: Burgers, fries, Cuban sandwiches and made to order veggie burgers. It usually sets up at lunchtime on weekdays near the courthouse. It is cash only, and most items are less than $9. Habanero Burrito Wagon: Burritos (chicken, steak, pork, fish, veggie), $5; tacos (same offerings), $2-3; Mexican sodas/Mexican Coca-Cola; chips and salsa, cookies, desserts. Nothing on the truck costs more than $5. Señor Roy’s Taco Patrol: Tacos (flank steak, grilled chicken or Al Pastor slow-roasted pork shoulder) are two for $5 or three for $6. Burritos or quesadillas are $6 each, and everything else on the menu is $5 or less. Taco Azul: Tacos are $2 or three for $5; burritos are $7; and most menu items are $5 or less. The Chilimobile: Cheese coneys for $2. This truck can be found in the city parking lot at 5th and Race across from Macy’s. The Koreans are Coming, The Koreans are Coming! This summer marked a new round of competition for Los Angeles based food trucks Kogi BBQ and Bull Kogi. Their 2 dollar Korean taco menu is being assaulted by a truck offering the same cuisine for half the price. 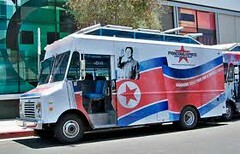 Pyongyang Express is a North Korean food truck that proudly flies the flag of the Democratic People’s Republic of Korea and an image of its dictator Kim Jong Il but the difference from this truck and its rivals in the Los Angeles area is that this truck was designed to provide viral marketing for a video game. THQ’s Homefront is to be a first person shooter style game that revolves around a plot which has North Korea invading the United States in the year 2027, and is due for release in March of 2011. Although the Pyongyang Express was launched in June, the fact that the game’s release is less than 6 months away means the truck already has a use no later than stamp on it. If the rumors are true, these Los Angeles truck owners won’t have to deal with this invasion for the entire 6 months. We have heard through the grapevine that the Pyongyang Express may be headed to New York and San Francisco to market in those cities before the game’s release, leaving LA in its dust in the near future. Behind the wheel and stove of the truck is 76 year old Bob Gottlieb, who just so happens to be a Korean War veteran, a US Korean War veteran at that. When asked about his thoughts about the fare he prepares he said, “North Korean people take much honor and care in every ingredient used in their recipes, unlike very fast, tasteless food. Pyongyang BBQ caters gourmet food and should not be considered street food.” Gottlieb also mentioned that at one of its early stops, the truck was shooed away from the front of the Korean Consulate by armed guards. Not quite what one might expect from fellow comrades. Angeleanos have not been too concerned with this marketing ploy, as they have been more interested in the trucks motto; Subsidized Good Food for a Better America. The truck offers a simple, yet inexpensive menu which includes chicken or beef Korean tacos, chicken or beef rice bowls and kimchee quesadillas. All of these items are priced at 2 dollars and under. Will this Korean food truck be looked at as part of the Axle of Evil (excuse the pun), or will their customers take into account that the meals they order consist of more food than the average North Korean eats in a month, for under 5 dollars? Have you had a chance to try out their food, if so, what are your thoughts? 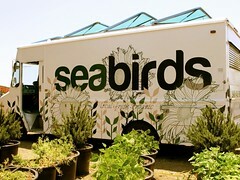 Profiling mobile eateries is becoming a more difficult task for us at Mobile Cuisine Magazine. With every passing day, we receive numerous emails and direct messages on Twitter. These leads and tips give us scoops about new trucks and new cities that food trucks and carts are being allowed to operate in. From Durham, NC to Portland, OR, street food vendors are opening up on a daily basis. The tough part is narrowing down who is to be covered. This is fantastic for us, since if we chose to, we could profile 5-10 trucks a day…every day. With that said, some towns are getting more mention than others due to their fans, and our readers. One such town that is continually being referred to us is not one that jumps to the top of the list when you think about mobile food, but in our estimation, that is coming to a close very shortly. Columbus, Ohio, home of “the” Ohio State University, is quickly gaining a name for itself within the industry and it’s community, and we have taken notice. Although the city doesn’t have specific codes governing food trucks, mobile vendors must still obtain health department approval and a peddler’s license as well as licenses for any additional employees they may have. The Columbus traffic code states that a vehicle selling goods cannot park on the street for more than 15 minutes, thus trucks must operate on private property; pushcarts have to work by a curb and leave at least 5 feet of pedestrian sidewalk space between the cart and the adjacent building. “It’s a safety issue,” said Sharon Gadd, the city’s licensing manager. To research for today’s profile we were able to get a list of mobile vendors from the Columbus Underground Discussion Forum. At the top of their list sat our choice for a vendor profile. Last year, James (Jamie) Anderson sent out an email to his restaurant (Smackies BBQ) followers, which included this snippet, “I have opened three restaurants and I have closed them all. I couldn’t seem to get my blood pressure down and closing the restaurant I think has finally got me nice and calm and I think my blood pressure is right where it needs to be. The restaurant biz will make an old man out of a young man really fast. So I have went back to my roots. ONE MAN – ONE SMOKER. I have no restaurant and no staff to babysit. Just me and my Pit, back to the basics.” And so was born Ray Ray’s Hog Pit. The smoke coming from the corner of Pacemont and High Street, is not what you may think it is, rather, it is the smoke generated from the barbeque pit of Ray Ray’s. 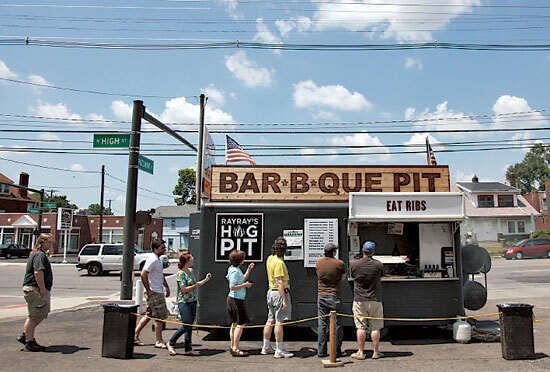 The pit is situated in a barbecue cart where, on a blustery day, the aroma of hickory smoked brisket carries for blocks. The cart is only open Thursday through Sunday but on those days, there is always a line. 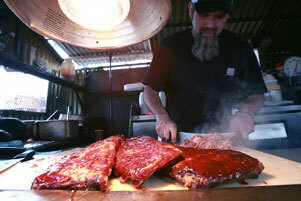 According to his fans, that is because nobody in town makes better ribs than this Pit Boss. Ray Ray’s orders their beef from a certified organic farmer raising Heritage cattle in Oklahoma, and smokes it with only a light seasoning of salt and pepper. Once the meat comes out of the smoker, it is rubbed with Ray Ray’s special seasoning (paprika, onion powder, and sugar) and doused with his homemade Dogfish Head Ale Barbecue Sauce, a tangy South Carolina style sauce and is finally grilled. The menu consists of 3 meat options; ribs, brisket and pulled pork. 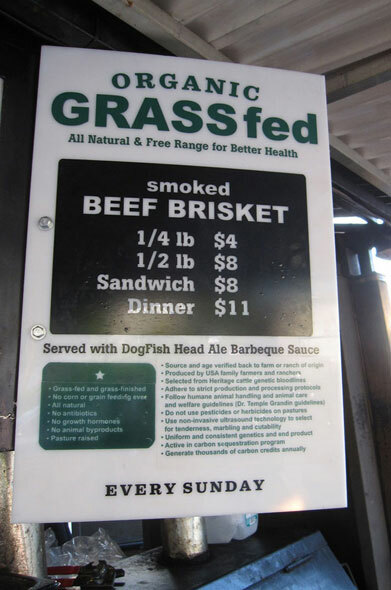 If you make your way to this food cart on Sunday you will have the additional option of a lean grass fed beef brisket. Once you have made your selection, you have the option of three sauces, mild, hot and habanero. The tasty side dish options are Southern style collard greens, macaroni and cheese, baked beans and coleslaw. Any of these sides will help to compliment to main course. Should you have room after your meal, there is a desert offering which normally consists of banana pudding and fruit cobbler which are all made by Jamie’s wife. You can follow Ray Ray’s Hog Pit at Facebook. As a sports fan growing up in the Northern suburbs of Detroit, MI, I had the opportunity in the 70’s to latch onto a sport that had a relatively small niche following. The National Hockey League was available every Saturday evening via the CBC (Canadian Broadcasting Corporation) before the advent of cable television. I would watch my home team Red Wings every chance I had and grew to love the sport even though, I didn’t play it. In the 80’s the league expanded and began to take teams out of small markets in Canada and the US rustbelt, and moved them to warmer parts of the country in an attempt to wrestle away viewers of the NBA and NFL. The league had some success in doing this, and went prime time when the NHL signed huge television contracts with ESPN and FOX Sports. What happened next was alien to me, but in an attempt to make the sport more palatable for the whole country, the NHL agreed with FOX, to allow a blue dot to follow the puck during play on their national television broadcasts. This trend quickly died, as long time fans, turned the channel in disgust, as they watched as their small niche sport make the move to the big time. The ratings started to plummet enough that both ESPN and FOX dropped their weekly programming of hockey, why? 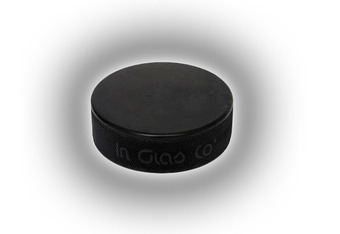 Because the original fans stopped watching, and the trendy new blue puck wasn’t enough to keep the new fans. A new trend in the food truck industry has reminded me of hockey history, and if something isn’t done to protect it, we may see the equivalent of a blue dot following the food trucks in our industry. Although food trucks have been in the United States (primarily NYC and Los Angeles) since the 70’s, the industry has reached new levels of prominence in the country over the last 3-5 years. The big turning point for the industry was this year’s inaugural season of Food Network’s “The Great Food Truck Race” which brought mobile cuisine to the national stage. Food trucks are popping up in every region of the country, and more and more cities are legislating new ways to allow the industry within their limits. Yes, this is great for the mobile entrepreneurs who prefer to open up mobile dining vehicles as opposed to traditional brick and mortar establishments, but at the same time, large corporations are starting to look at the industry as a means to market for their already established restaurants. 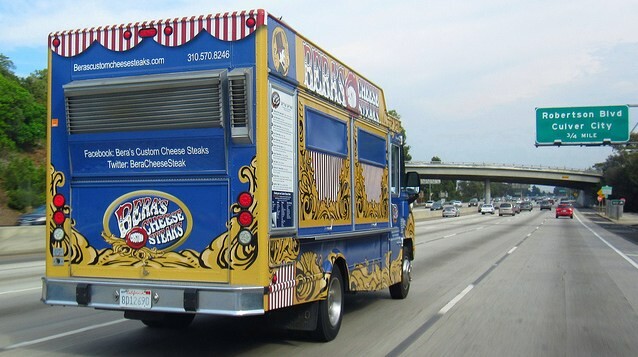 It has been reported over the last few months that companies such as Sizzler, Tasty D-Lite and Cousins Submarines are planning entry into the food truck industry. It appears, their marketing strategy isn’t to help the food truck industry, but to attract customers to their in-line restaurants. I found out from the Wall Street Journal, that Aaron Webster, owner of three Tasti D-Lite stores in Houston, says he bought a used van last year for $90,000 from the frozen-dessert brand’s parent company. It’s complete with a small refrigerator, freezer, sinks, countertop, soft-serve machine, toppings bar and power generator. A bubble-gum pink exterior features the brand’s logo and website address. Mr. Webster, a former investment banker, uses the van to sell ice cream mostly at community events and for catering jobs. He says mobile sales account for less than 2% of total revenues for his businesses but that the van is helping to raise brand awareness. “It’s really a roving billboard,” he says. A roving billboard? Is that really where we want to see the industry head? Of course the National Restaurant Association opened up a measly 1,500 square feet of its annual show to food trucks last year, how else would they be able to show all of the national restaurant chains how they can expand their current stores? Please don’t take this article the wrong way, expansion of the industry is a good thing, and healthy competition on the streets will help to maintain creative menus and innovative fare being served from food trucks. However, our concern is what the next step in this evolution may entail. As it stands today, many cities already have limits on the number of licenses they issue to mobile food vendors, if these mega corporations delve into food trucks with the backing of their huge coffers of capital, where will that leave the small business owner who loves to cook, and has a new twist on burgers or tacos they wish to share? Will they have to wait 10 years before getting the proper license because Taco Bell or McDonalds already has fleets of 10 plus trucks rolling around each major market in the country? Will cities draw back from their current support of the industry because there are too many corporate applications being submitted for review and approval? Or even worse, will there be a backlash by the current followers of trucks such as Kogi BBQ, The Big Gay Ice Cream, or The Nom Nom Truck? Will these loyal fans turn their backs on the established trucks because of the onslaught of profit driven establishments that litter every corner of the public right of way? I certainly hope not, however, if nothing is done to help protect against this, I am afraid in the next few years we may have our own version of the blue dot following our industry. Today, Monday, November 15, kicks off NBC Universal’s Green Universal Week, and at the same time, another Meatless Monday is upon us. 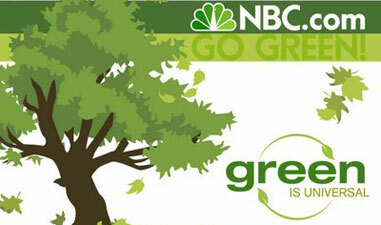 NBC has invited The Green Truck to aid them in their promotion by driving around NYC and giving away a free vegetarian lunch. Today’s free lunch special will be The Mother Trucker, a vegan burger with avocado, tomato, sprouts, and tempeh bacon. The burger itself is made up of mushrooms, zucchinis, broccoli, squash, and onions, sautéed down with olive oil and tomato paste. If a vegan burger isn’t what you are looking for today, the truck does offer a number of other vegetarian specials. Customers can select from a varied menu which also includes a breakfast burrito with a tofu option, and instead of iceberg lettuce, they serve dark leafy greens which provide more nutrition for your diet. “It’s a healthy alternative to the ‘roach coach,'” said Michael Klima. “A lot of people eating vegan or raw believe they are living a healthier lifestyle and they feel better,” said Michelle Dellapena. The Green Truck’s site has a GPS tracker so you can locate the truck. If you are anywhere near 30 Rock this afternoon, we suggest you take a trip to The Green Truck, and help celebrate Meatless Monday’s with one of their Mother Trucker Burgers. Not only will you be supporting a great cause, but you will be able to save yourself a few dollars. You can find The Green Truck at their website, or follow them on Twitter.